Stirling Council have helped pay tribute to a police constable from Bannockburn who was killed in the line of duty 100 years ago. Constable James Campbell was shot on 18th January 1919 and subsequently died of his injuries on 20th January 1919. 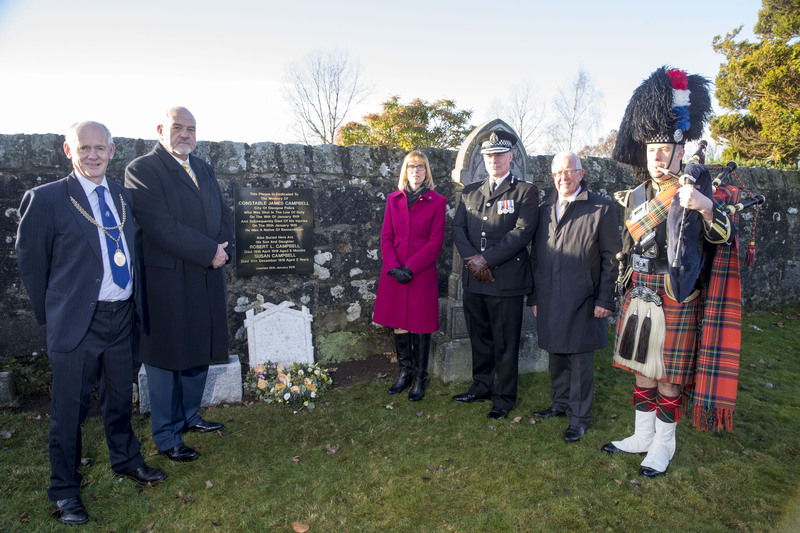 To mark the Centenary of his death, the dedication of a commemorative plaque in his memory took place within Bannockburn Cemetery on Sunday (20th January). Constable Campbell was born in Bannockburn and joined the City of Glasgow Police in 1901, serving for 18 years in the Eastern Division. Described as an officer of ‘high quality and resource’, he was fatally wounded whilst disturbing housebreakers in Great Eastern Road. The original gravestone was donated as ‘A token of esteem from officers and constables in the Eastern Division, Glasgow Police’ as his family had no money for a memorial. Stirling Council Baillie, Alasdair Tollemache, was among the dignitaries who attended a service of Dedication, which was led by the Scottish Police Federation. Ballie Tollemache said: “It was a very poignant service and I am delighted that we were able to help commemorate the sacrifice made by Constable James Campbell.